On my calendar was recovery from back surgery this past week but there was a change of plans; a dental issue came up and surgery was postponed. Instead I am taking antibiotics and will have minor dental surgery in a week or so. The back surgery will probably be within a month or so after that. Let it not be said that I don’t know how to have a good time! I’m a firm believer that what is happening is happening and what is not happening is not happening so I am rolling with it. In the meantime I am up to my usual tricks and getting some work done in the shop. In the photograph above is a simple setup for cutting fret slots. The miter box is made from scraps of MDF and the depth stop on the saw is a strip of wood held in place with three colorful spring clamps. The wooden cam clamps hold the miter box to the work-board and holds the fretboard in place while sawing. This low-tech setup works remarkably well. I have templates for fret patterns I commonly use. The templates eliminate calculating and measuring out the fret positions. This fingerboard is for a custom chromatic dulcimer with a scale length I have not used before; 743 centimeters! That is a very long string length but is what the person who will be playing this dulcimer prefers. Since I didn’t have a template for this scale length I had to calculate the fret positions and lay them out on the fingerboard. Fortunately, there is software that does the math. In the 1970’s I had to spend a long time with a calculator to work out fret positions. The constant often used to calculate an equal tempered fretboard, 17.81715385, is still permanently installed in my memory. I laid out the fret positions using a very accurate ruler, machinist’s square, sharp knife, and patience. I triple checked the measurements before sawing the slots. Sawing the slots with the miter box was the fun part. In the photograph above are some of the tools I use when filing frets after they are installed on a dulcimer. 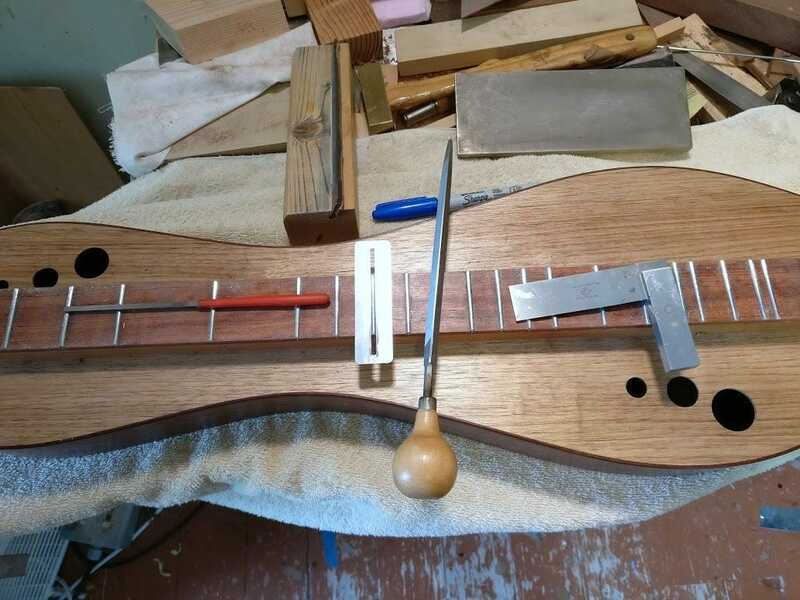 On this dulcimer the ends of the frets have already been filed flush with the sides of the fingerboard. The next step is to assure there are no high or low frets as these are one of the causes of buzzing and other annoyances. I draw a line along the top of the frets with a marker and lightly file the tops with the flat, fine diamond sharpening stone. When the lines from the marker are gone I know the tops of all the frets are level. I choose the color of the marker based on the dulcimer’s aura. This one needed blue. Only kidding. Or am I? The tops of frets need to be round and define a singular point of contact when the string is pressed down behind it. I mark this point by again drawing a line with the marker along the crowns of the frets. I use the triangular file to file the sides of each fret so it slopes towards the line until there is barely a hint of the line left. The corners of the file have had the teeth ground off to help avoid gouging the fingerboard. The metal shield placed around the fret I am working on also helps. 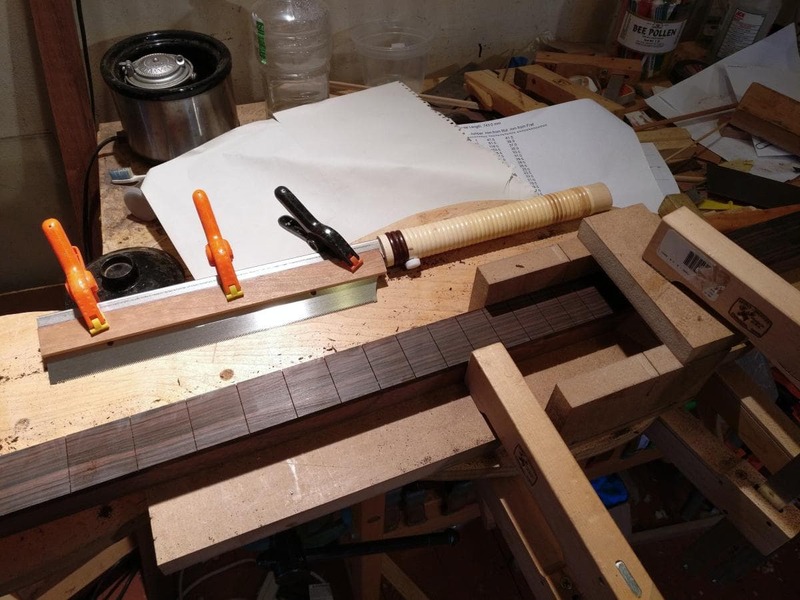 The small metal square is one of several in different sizes I use as straight edges to assure the tops of the frets are still level as work progresses. The block of wood with a file embedded in it at an angle is used to bevel the ends of the frets. The small, skinny file with the orange handle is used to deburr the corners of the frets at the edge of the fingerboard. The same file is use to round the end of the frets. Skipping this step usually results in blood loss for the player; the ends of the frets become sharp after filing. 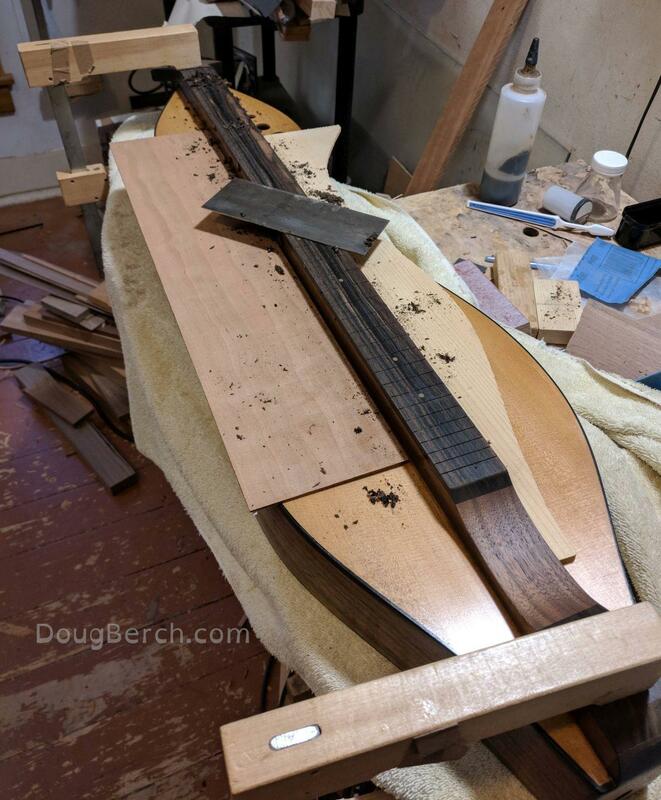 After completing all the above the crowns of the frets are further rounded and polished with fine sandpaper, steel wool, and then buffed until they shine.